at the brim to overflow. to wash off easily ashore. each day is a challenge. A beautiful poem. Is it yours, Jeevan? You have written a nice and touching poem to express your thoughts well. That hidden wooden house is my dream place for retirement. Sandi - Yes, of course it is my poem wake up from the emotions. Mom is doing well and healing as well... She's in complete rest now and pain free. Today she is going for review after 10 days of surgery and I hope everything was positive. Challenges and joys are the two pillars of life. It cannot exist without either! Beautiful poem, btw. That is a nice quiet hideaway but I wouldn't want to be alone there. A very nice poem. I hope everything is well and may peace dwell in your heart. 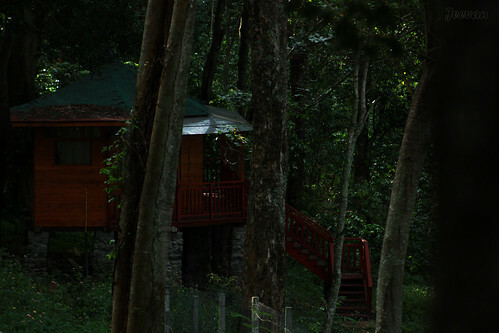 What a beautiful hideaway, Jeevan, and your poem is absolutely amazing. What a lovely companion to the picture. I would like a hideaway in a quiet pretty wood. Lovely poem. That’s a beautiful poem, Jeevan. Life has its happiness and struggles like rowing in a rough sea. I love the little hideaway- it seems like a wonderful escape. The photo is such a subtle set of low colors giving it an eerie feeling.